Well, the music seems to have turned horribly French. Interfered with and compromised at every turn by those meddling douche bags Weinsteins, it's a wonder there's any magic in this at all. 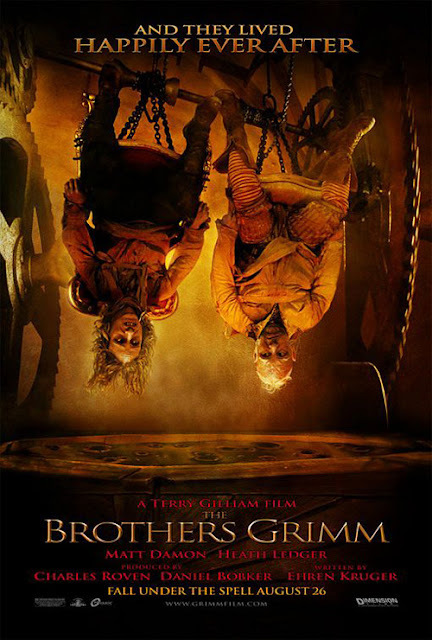 As it is, it's Terry Gilliam’s weakest film since his debut Jabberwocky - and even that had a visual consistency lacking here. The plot just ain't there (the brothers go back and forth to the tower three times) and what should feel energetic is too often just heavy-handed. Matt Damon is miscast, but even Heath Ledger doesn't fare that well; both are stranded with underwritten characters than no opening coda can add bite to. Lena Headey is merely adequate and Pryce trots out his usual hammy villain (though I like his last line about quiche). It's left to Monica Bellucci's cameo and the wonderful Peter Stormare to slide comfily into Gilliam's world. There are some great moments; a horse swallowing a child as a shadow on a wall, Pryce holding the illusion of a vast banquet with mirrors, another child losing its face when attacked by mud (the mud baby is both bizarre and crappy though) and Ledger climbing the tower. Very flawed then, but interesting.